When my old-coworker Jasmine first reached out to me for design help, I'll admit I was a bit surprised. I'd seen photos of her gorgeous New Mexico wedding and knew that living in cities like New York, Berkeley and Seattle would've exposed her to stylish people and spaces. But Jasmine works full-time as a VP of Content for LaunchSquad, has two young kids, and admittedly felt overwhelmed by the design process. "Ummm can we really talk about helping with my house? Truly, I need help. And I don't trust anybody else. I so desperately want a house that's warm and welcoming and kid-friendly and personal, but I don't have the time or energy to really do it. Plus I'm not great at color; it doesn't come naturally to me. I second-guess myself." I'm realizing that just because someone has great taste and can recognize it in other people's spaces, they may not have the a) time b) energy or c) vision to do it on their own (or all 3). Jasmine took a bunch photos and measurements of her pretty narrow open concept living/dining room for me (see below) and then filled out my Spruce Your Space questionnaire. What did I learn? That she's drawn to the colors that she wears a lot in clothing (we all are): navy, olive green, neutrals. She also loves modern lines, abstract art, and black and white photography. I learned that she met her husband in high school (they started dating later as adults) and that she loves some pattern, but only neutral doses of it. 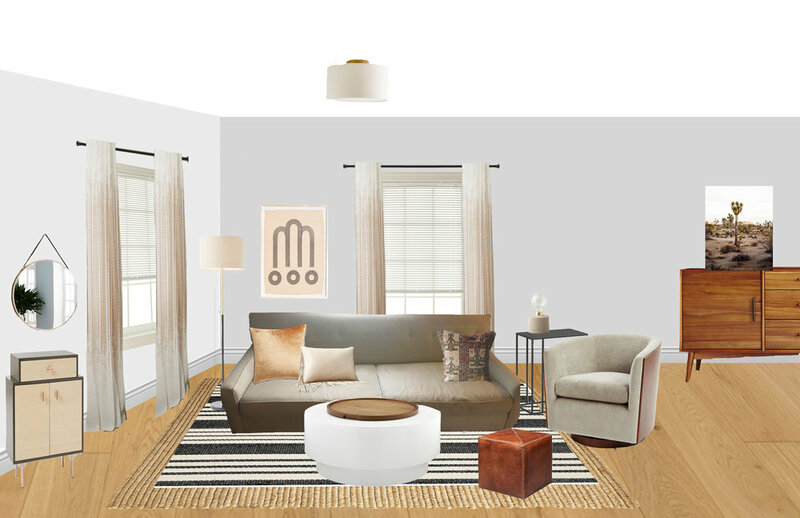 The more I know about a client, the more I can make the space really exude their personality. And so with this breadth of information, I started pulling inspiration for a Mood Board that I consider like the first paragraph of a story. It's always where I start when I write, and it's often the toughest to nail down. But once I'm happy with it, everything else just flows. Once Jasmine approved my mood board, I designed the space from the bottom up. I layered rugs she already had to create depth on the floor and incorporated entryway storage for keys, hats, umbrellas and more. Speaking of storage, I pulled in a coffee table that was clean and super kid-friendly, but also offers inner storage. I concealed her tv inside a beautiful console, placed an additional chair in the space to create a cozy seating arrangement, and then designed a gallery wall of artwork including family photos, a modern print from a favorite artist, and a brass wall hanging that I saw she had pinned on Pinterest. My favorite part: an old postcard of the high school where she met her husband that I found on Ebay and recommended she buy and blow up for the wall. "Jourdan!! We love this so much. Love that you found a Boulder High postcard and love that it all just makes so much *sense* with what we already have and our style. Also the art is perfect. All of it. I never, ever would have been able to do it myself. I can't really describe how amazing it is to have everything all picked out but still feel like it's totally my taste and also just really ... human. And practical."